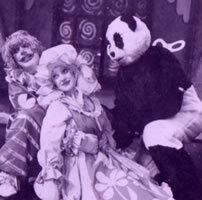 Following its premiere at the Queen’s Theatre, Hornchurch in 1978, BABES IN THE MAGIC WOOD was presented at the Forum, Wythenshawe (Manchester Library Theatre Company). There have been many amateur productions, and a major foreign production at the Koninklijk Jeugd-theater in Antwerp. 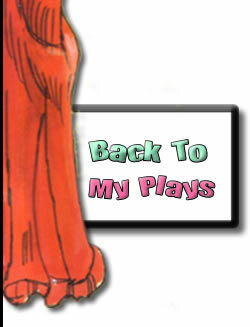 BABES IN THE MAGIC WOOD has an original storyline, and does not resemble the usual pantomime versions. Widow Crockett and her babes, Simple Simon and Contrary Mary, run a toyshop, their biggest job being the making of toys for Father Christmas’s order. One Christmas Eve they are very behind with their work and wish their Fairy Godmother could help. She appears and, under her spell, three magic toys, Jack-in-the-Box, Ragdoll and Clockwork Panda, finish the job while the Crockett family are asleep. Later the rascally robbers Pick and Nick see a chance, impersonating Father Christmas, to grab the toys for themselves. They are foiled, but much more perilous dangers follow. The Fairy Godmother turns out to be a wicked Superwitch, who almost makes a cauldron meal of the children in the Magic Wood. After many adventures the children, aided by the magic toys, and a clever donkey, triumph. They find themselves back in the toyshop – and it was all a dream. But was it? The magic toys have the last word. 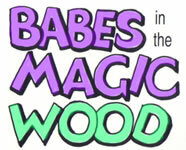 BABES IN THE MAGIC WOOD has an original storyline, and does not resemble the usual pantomime versions. Widow Crockett and her babes, Simple Simon and Contrary Mary, run a toyshop, their biggest job being the making of toys for Father Christmas’s order. One Christmas Eve they are very behind with their work and wish their Fairy Godmother could help. She appears and, under her spell, three magic toys, Jack-in-the-Box, Ragdoll and Clockwork Panda, finish the job while the Crockett family are asleep. Later the rascally robbers Pick and Nick see a chance, impersonating Father Christmas, to grab the toys for themselves. They are foiled, but much more perilous dangers follow. The Fairy Godmother turns out to be a wicked Superwitch, who almost makes a cauldron meal of the children in the Magic Wood. After many adventures the children, aided by the magic toys, and a clever donkey, triumph. They find themselves back in the toyshop – and it was all a dream. But was it? The magic toys have the last word. The original production used a company of twelve, doubling. There is scope for a larger chorus of carol singers and shoppers, plus small roles for children.